The United States Congress designated the Canaan Mountain Wilderness (map) in 2009 and it now has a total of 44,447 acres. All of this wilderness is located in Utah and is managed by the Bureau of Land Management. 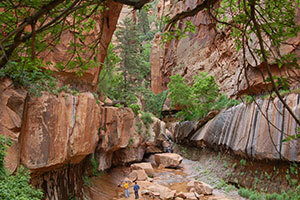 The Canaan Mountain Wilderness is bordered by the Cottonwood Point Wilderness to the south and the Zion Wilderness to the north. Within Canaan Mountain Wilderness, which is adjacent to the southeast boundary of Zion National Park, an 8-by-10 mile block of Navajo Sandstone, enclosed by 2,000-foot-high cliffs, has been sculpted by wind and water over time into a landscape of soaring cliff walls, natural arches, and slot canyons. Elevations here range from approximately 4,100 to nearly 7,400 feet. On the highest plateaus, stands of ponderosa pine are surrounded by cream-colored slickrock. Pinyon pine, Utah juniper, scrub oak, and sagebrush cover the mountain slopes, at lower elevations. Seeps in the canyon walls provide water for hanging gardens of maidenhair fern, monkeyflower, and columbine. Hawks, falcons, and golden eagles nest along the sandstone walls, while ringtailed cats, deer, cougar, and black bear live on the plateaus and in the canyon bottoms. This wilderness provides opportunities for primitive recreational activities, including hiking, equestrian trail riding, canyoneering, and camping. Several routes exist on the southern end of the Wilderness providing access to higher elevations by way of steep canyons. The Sawmill Trail, however, follows a historic logging route and traverses a large portion of the Wilderness. The 2.8-mile Eagle Crags Trail is the only route on the northern side and provides access to Eagle Crags at about 5,200 feet. All of these routes are primitive, not maintained on a regular basis, and not signed. There is a total of 14 miles of trails in Canaan Mountain Wilderness. Average temperatures range from 68 to 98 degrees Fahrenheit in July and from 28 to 52 degrees in January. Between 10 and 16 inches of precipitation falls annually. Planning to Visit the Canaan Mountain Wilderness? How to follow the seven standard Leave No Trace principles differs in different parts of the country (desert vs. Rocky Mountains). Click on any of the principles listed below to learn more about how they apply in the Canaan Mountain Wilderness.